I recently finished up this house portrait for a client. It was a very simple house, interpreted with a combination of fabrics for texture, and the background trees were watercolor painted with Setacolor transparent paints and then machine embroidered. The picture was stretched, matted and framed, and the clients were delighted. A happy ending! I'm also working on this fabric landscape. 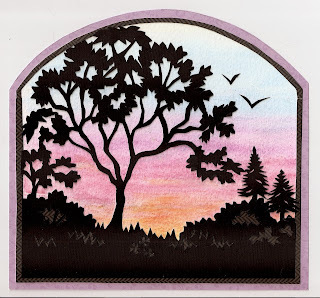 The background is hand painted fabric, on which I loosely painted some trees with the Setacolor paints. I plan to enhance the trees with machine stitching and add more hand painted fabrics and stitching to the foreground. Hope everyone who reads this is enjoying a great weekend! "O Mother Earth, you are the source of all existence. The fruits which you bear are the source of life for the Earth peoples. You are always watching over Your fruits as does a mother. be sacred and not weak." than the journey-work of the stars." Wishing everyone a Happy Earth Day, with hopes that we all join in taking care of our precious earth. but haven't posted it, although it is one of my favorites! There are metal elements which make this card unique! and these from Elaine! Title: "But teacher, I lost my homework!" And these were the cards I gave to Karen and Elaine! of one of my favorite quilt artists. I will link to her blog and show more of the cards when they are completed. Hope everyone has had a great weekend!! After the sadness of losing our Kristy, I was so happy to look forward to an "Artsy Craftsy Extravaganza" with my friends Elaine and Karen this past Monday and Tuesday! We met at Elaine's house, had a fun lunch with Karen, her mom Elaine, aunt Margretta and and sister-in-lawSarah, swapped ATCs, shared our artwork and handwork done since our last meeting in November, and perused and shared wonderful books around the dining room table. Much chatting, many laughs, an overnight leading to a delicious breakfast at "Amber Cafe" and a visit to a great fabric store all added up to a wonderful time! How lucky am I to be a part of this group and we're planning to get together again in the fall! I knew that Karen's birthday was coming up (it's today!) so I made her a portrait of her beautiful cat, Henry, taken from one of her own photos which you can see here. Karen seemed to like it and it was a joy to spend time with this wonderful family! Just what I needed! Tomorrow I'll share some of the ATCs we exchanged. Today we said good-bye to our little Kristy. but our lives will feel empty without her. You'll always be in our hearts. As I walk outside on these sunny days, I feel a huge swell of gratitude for the sun, the blooming flowers, and the textures I see all around me. I've started making some quick collages to express my emotions and find it to be very freeing. I'm usually a representational kind of girl, sticking to realistic pictures, but my scraps of fabrics and threads, tumbled together on my worktable, are calling out to me to let them play together in an abstract way! This little piece has handpainted scraps, paper fabric and some commercial fabric too! OK, this is fun! 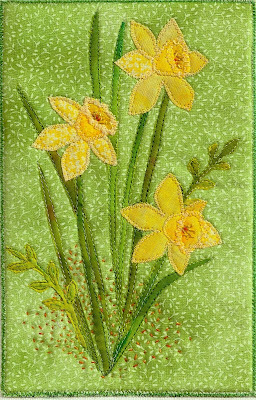 Inspired by daffodils on my porch! I've missed my blog, and I'm glad to be back.